For me personally, the primer has been one of the best make up discoveries in the past year. I have always had issues with unevenly applied foundation and a patchy look since my skin is acne prone. Primer, I found preps the skin and gives a nice and smooth base on which you can apply your foundation. Primers are light and help fill out the pores and even out skin tones. 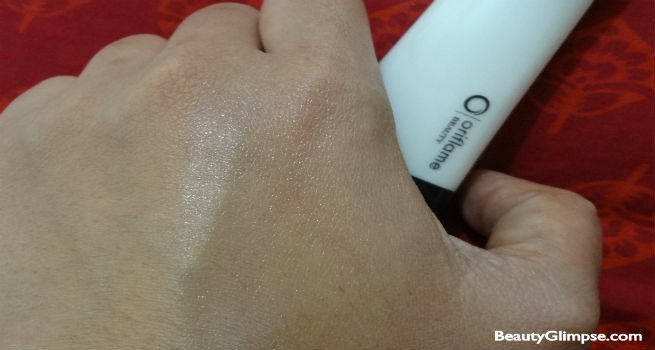 I bought a small tube of the Oriflame Perfecting Face Primer which I am really loving and am going to review here. It comes in a small 30 ml tube and is priced at Rs. 429. You do not need to wait to meet an Oriflame representative anymore to buy the product since it is widely available in many online stores. Morning-fresh make-up – all day long! Light diffusing properties and emollients give your skin silky softness and an even complexion and comfortable make-up application. The result is the perfect base for your make-up and a wonderfully radiant finish. A whole lot of chemicals. True to its claim, the Oriflame Perfecting Face Primer is light and gives your skin a matte finish. It is white in color with a lotion like consistency. It blends evenly with the skin. I have not really experienced any luminosity from its light diffusing particles. But yes, it does make foundation application that much more easier. I noticed that the foundation also gets absorbed better with it. It also prevents my skin from breaking out after I use makeup. Notice the right half of my hand on which I have applied the primer. It makes for an excellent base on which you can blend in the foundation. As for its application, all you need to do is, cleanse your face well. Follow it up with your regular face prep regime- toner and moisturizer/sunscreen. Take a pea size of primer on your finger and dot it all over your face and jaw. Blend it well. Next, dot the foundation all over your face and neck. Blend well. You will notice that the foundation application is easier and more even.The primer also helps my foundation stay a while longer than it normally would. Normally, what would wear off in a couple of hours, now stays for 4-5 hours. I have an oily skin, so maybe the effect is reduced. If you have dry skin, the results could be better. At Rs.429, it seems like a decent buy if you are starting off with experimenting with primers and also when compared with the few pricey primers available in the market. When you invest so much on good foundations, then this price is good enough to get that extra out of your foundation. Light and gives a dewy finish. Makes the foundation last longer. Gives your skin a matte finish. Its effect wears out halfway through the day.